Rob Gronkowski (center) partied at Foxwood’s Shrine Nightclub Tuesday with (from left) Glenn Gronkowski, DJ Dante, Gordie Gronkowski, and DJ Shaun Frank. Rob Gronkowski continued his Super Bowl celebration at Foxwoods on Tuesday night. The Patriots tight end was partying at Shrine Nightclub with his brothers Glenn and Gordie , and hip-hop star Rick Ross. 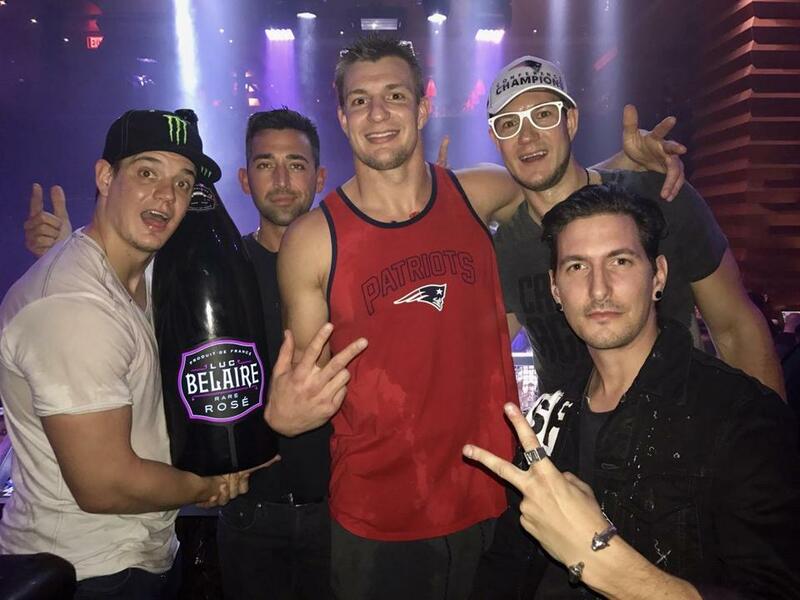 We’re told Gronk and his entourage cracked open and sprayed about 45 bottles of champagne — including 15 liters of Luc Belaire — and doused the jubilant crowd with bubbly from their perch in the DJ booth at the club. While Ross performed, Gronk pumped up the throngs of Pats fans in the club. He busted out his sunglasses, danced, and chugged champagne, as Gronk is wont to do. Devin McCourty. Brandon Bolden, Duron Harmon, and Logan Ryan at ICON. Meanwhile, closer to home, several of the Super Bowl champs partied downtown at ICON. among them Devin McCourty. Brandon Bolden, Duron Harmon, Logan Ryan, LeGarrette Blount, James White, and Dion Lewis. We’re told that patrons at one of the club’s VIP tables purchased over $25,000 worth of champagne and sent it to the players to celebrate. The party was put on by 6one7 Productions and 235 Entertainment.